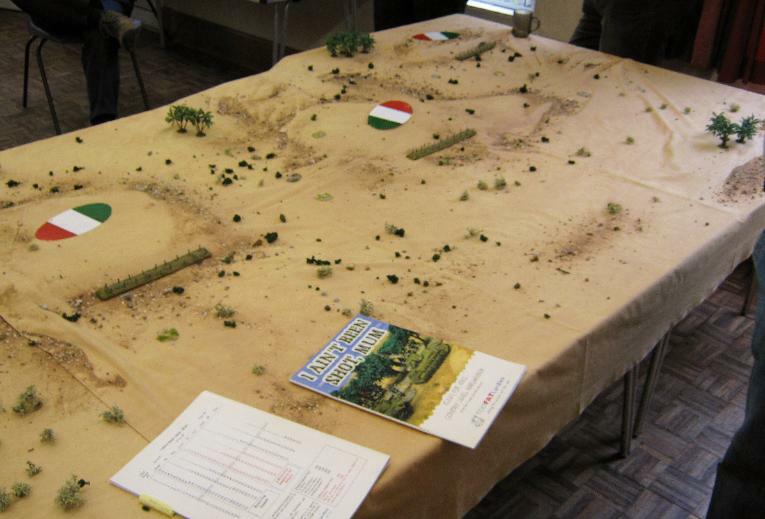 On June 12th 2011, the Too Fat Lardies Tobruk Games Day was held at Lard Island, St Albans. What follows is one man's report of the action. out, not to fight in the area where the two sides of the L shape met. they were in fact off table for us to direct. No matter. 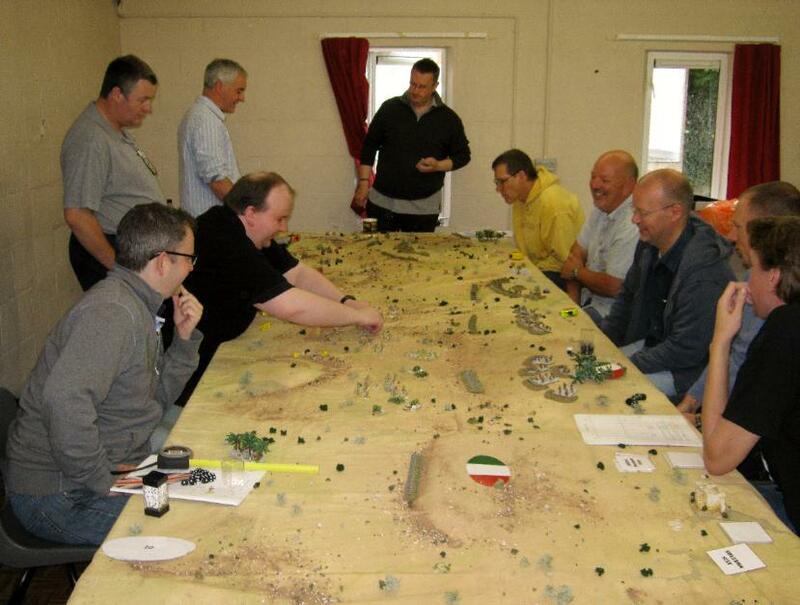 extreme left flank rear, almost infact facing our comrades on the next table. spotting was shite, as ever. I moved round the flank with my two blinds and then Mick arrived and took over one of them. Joe (Below left) and Egg (guess which one?) were facing us. Hello Joe sorry I didn't realise you were' that' Joe Legan until I'd left. attention from Clive and Mick. Egg's command was being used against Dom and Keith, not against Clive. 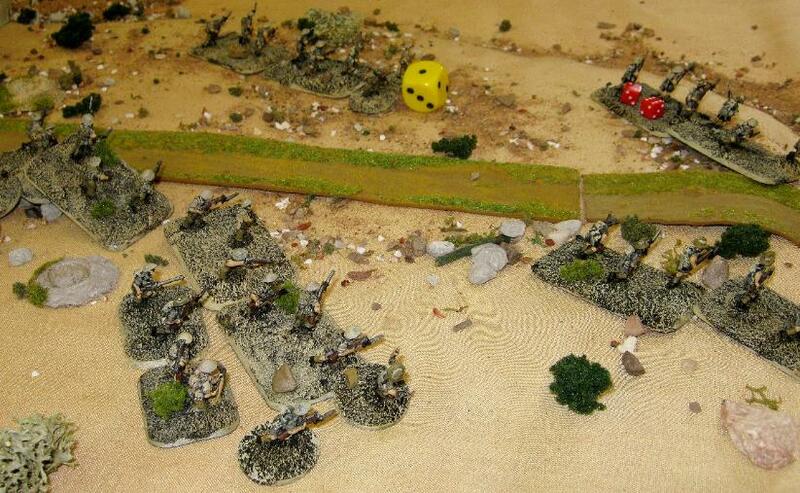 Clive called for artillery support from off table mortars and made the inspired decision not to fire ranging shots but immediately fire for effect. 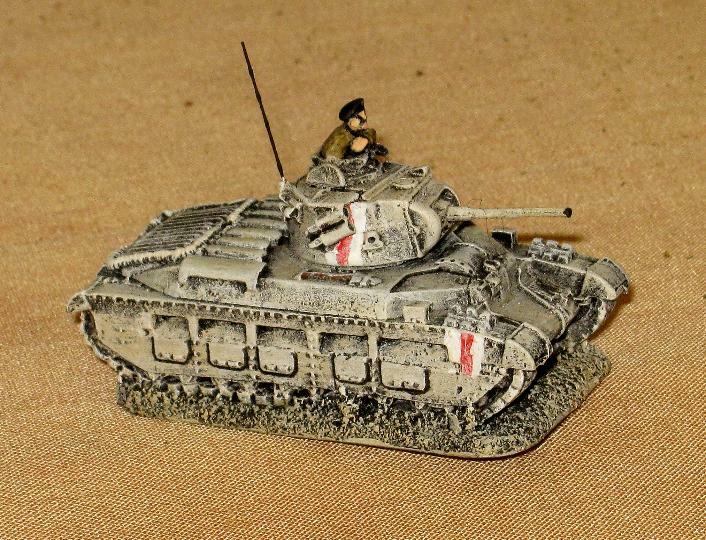 rear which was not a fake but infact another full Italian platoon with supports. 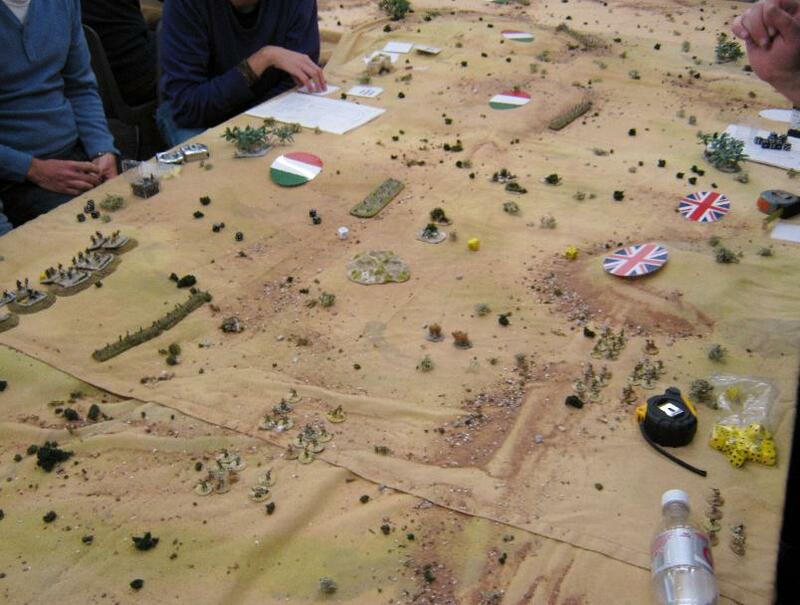 told another table would appear to the rear for a tank Vs gun battle. Matilda's were spotted, by then it was too late as he exited without loss. We had done our job, though personally I hadn't done much. 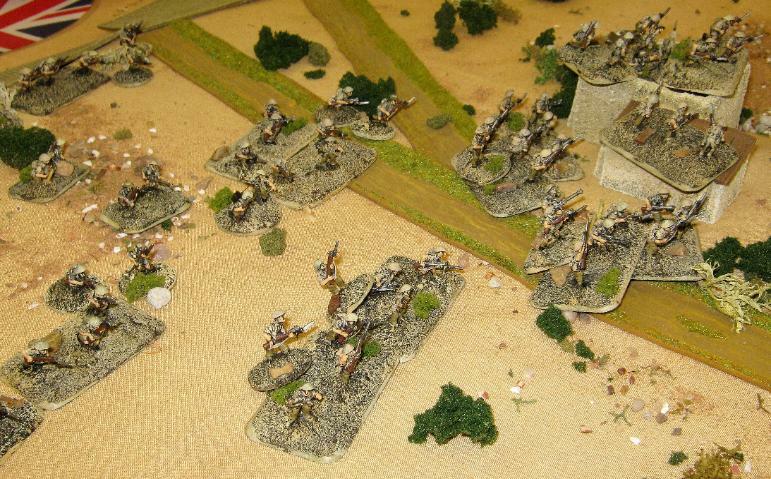 the whole co-ordination thing again whilst I moved to occupy the former Italian position with my weak sections. 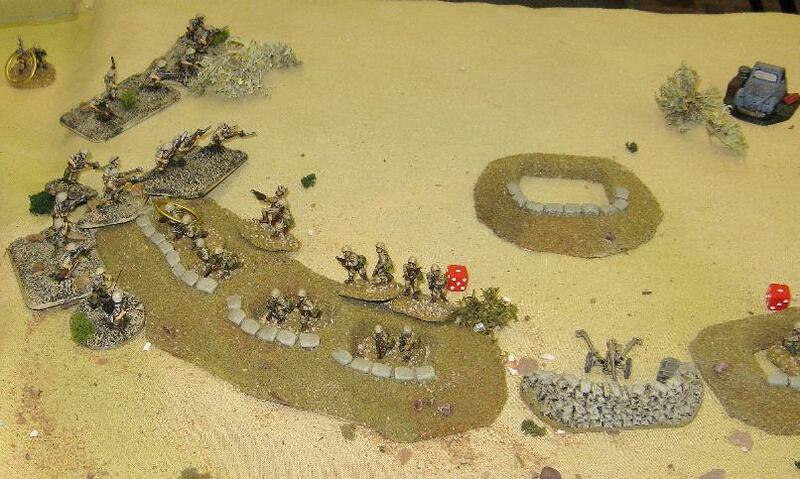 The morning game was pretty much over by now and action shifted to the Matilda Vs Italian gun line table. sight Martin continue to get well soon mate. 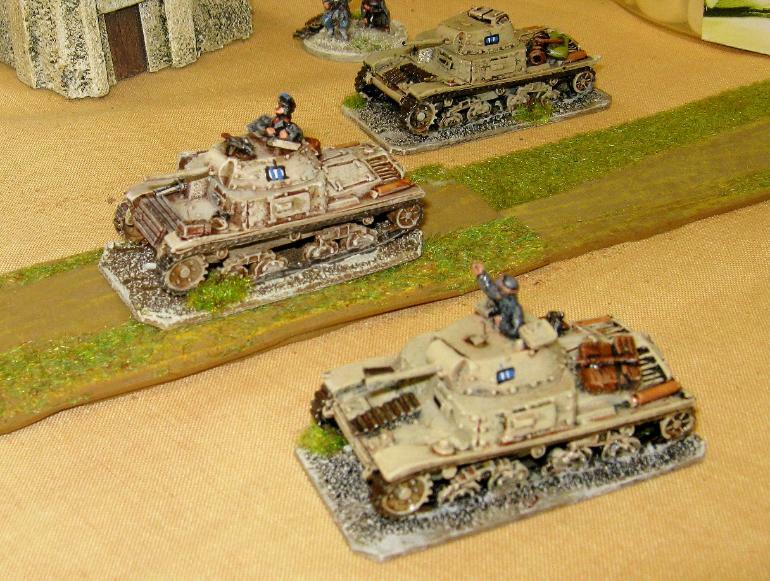 Matildas got near enough for a four to have minor damage, no mean feat when the Italian gun factor was 5 Vs 9 for British armour. were available for the afternoon. 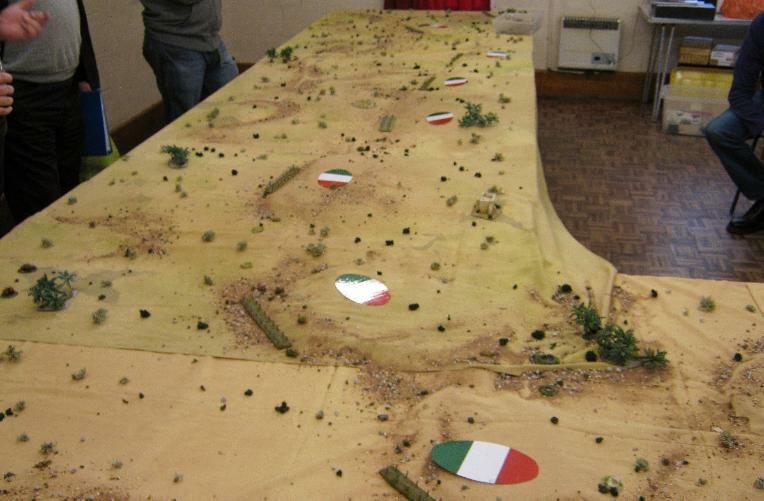 Edward had been against the strongest Italian position, as it turned out and had been flayed. 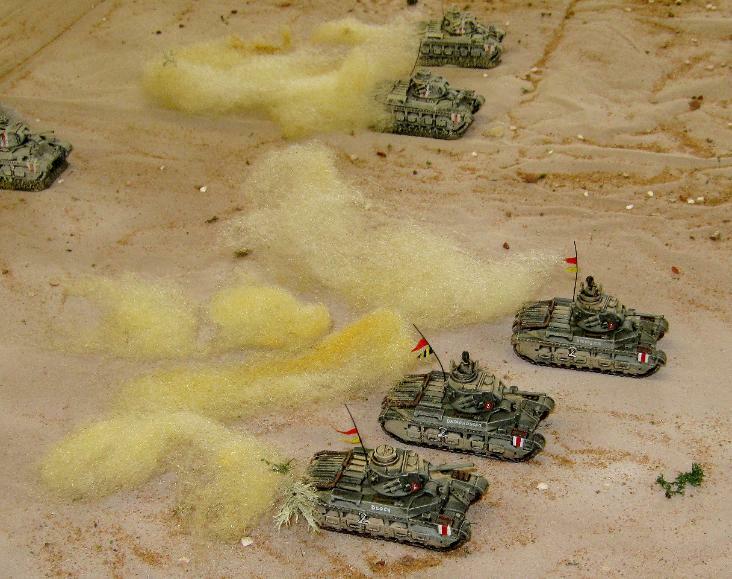 It was more like the Somme than North Africa. Dom and Keith next to us had also had a rough time of it. Max, Chris and Egg from our table had pounded them too. 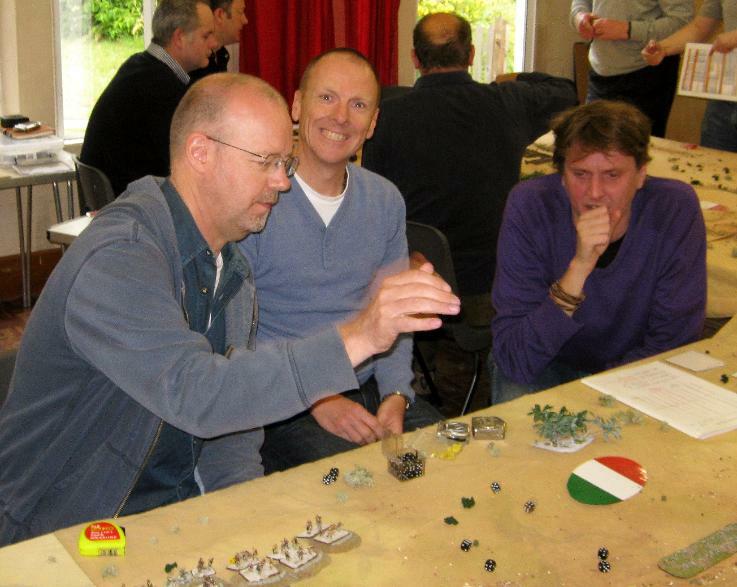 The afternoon saw Mick, Clive and I vs Max and Chris. We had to take an airfield entering from the eastern table edge and exit the western table edge destroying all enemy forces. A tough task indeed. two dummy blinds. 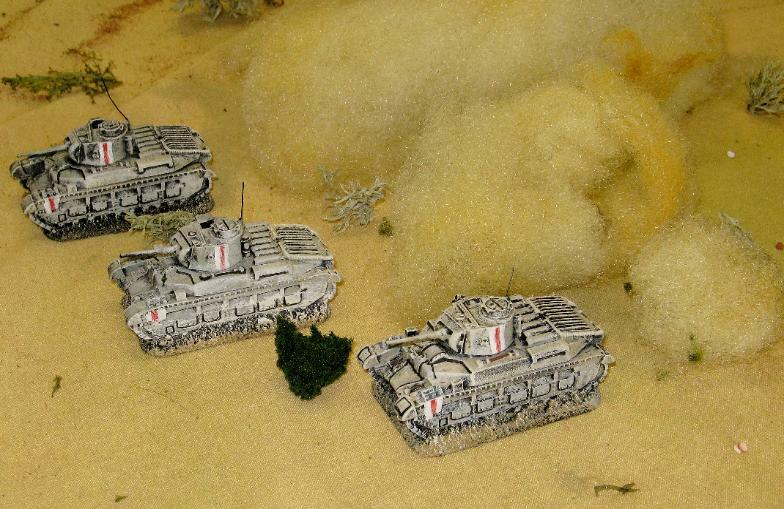 We were to be reinforced by two Matilda tanks from the north western corner on the sixth turning of the blank card. 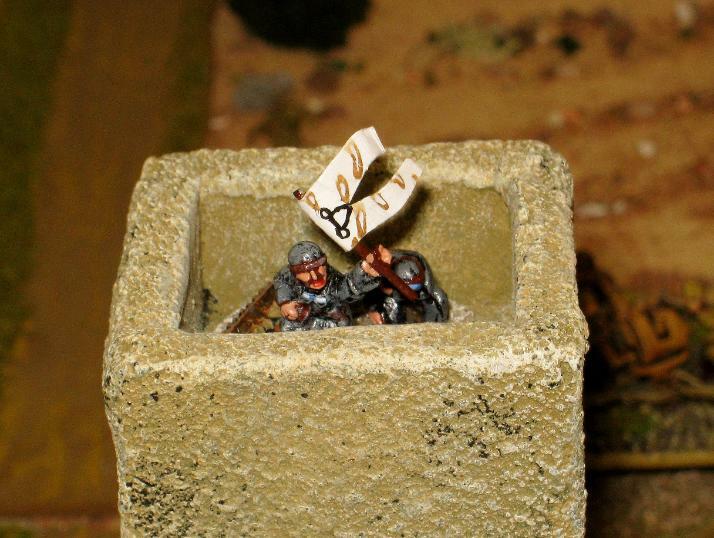 Platoon in support. Clive bringing up the rear would take the buidings and react to the enemy. 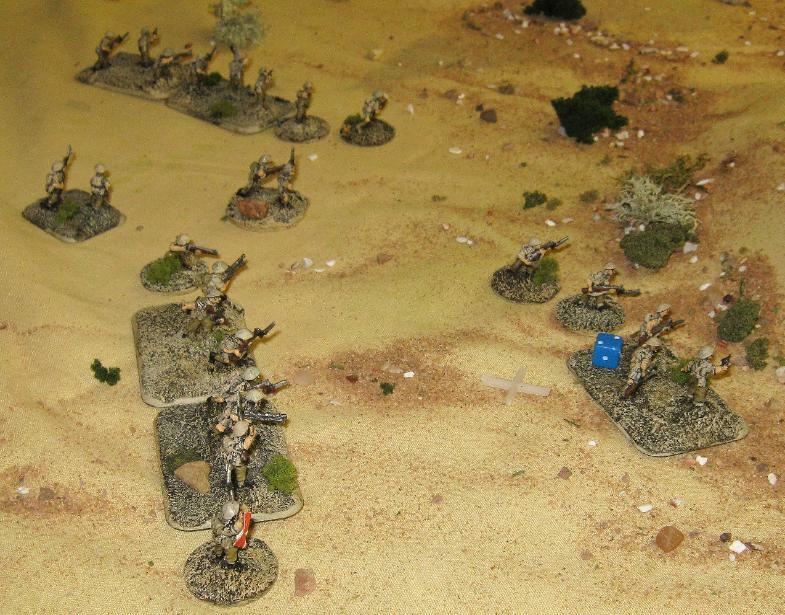 I decided (foolishly as ever) to assault the first AA gun with two squads and failed in their three movement dice, falling short by 1" each time. 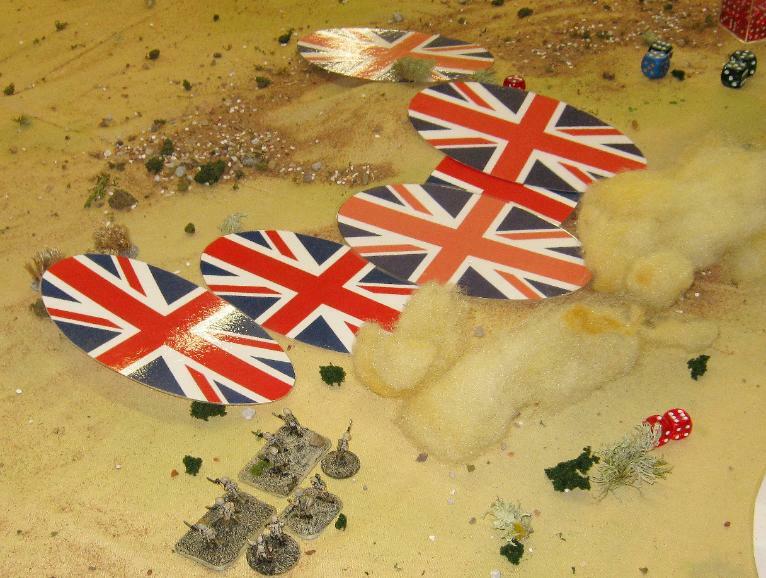 that I decided to keep two sections back and suffered mainly wounds as I was at long range from three AA guns out of the four available. 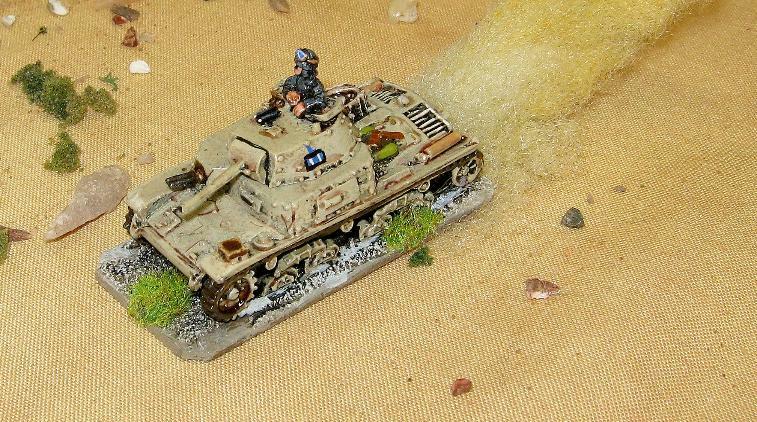 A second assault saw me finally take the AA gun but still exposed I took heavy casualties. them. 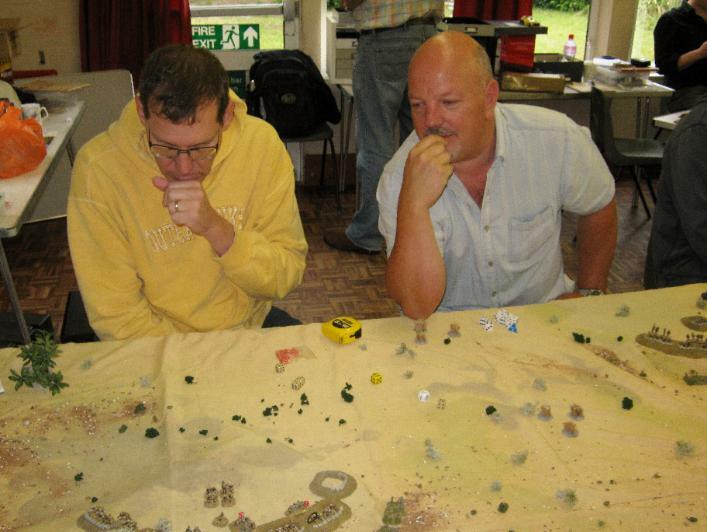 The Italians were firing and fighting hard and we were taking casualties as Clive and Mick pressed on to assault the airfield buildings. 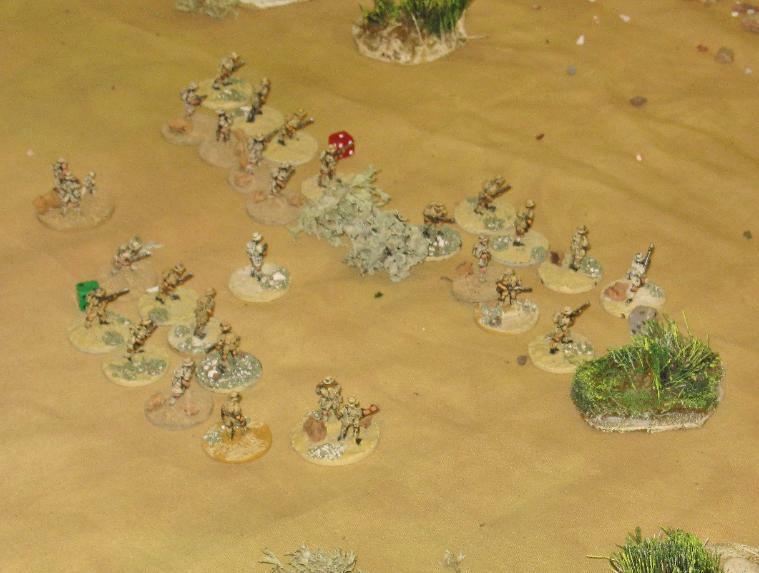 Suddenly an Italian blind appeared on the baseline far away, but facing my battered Platoon. 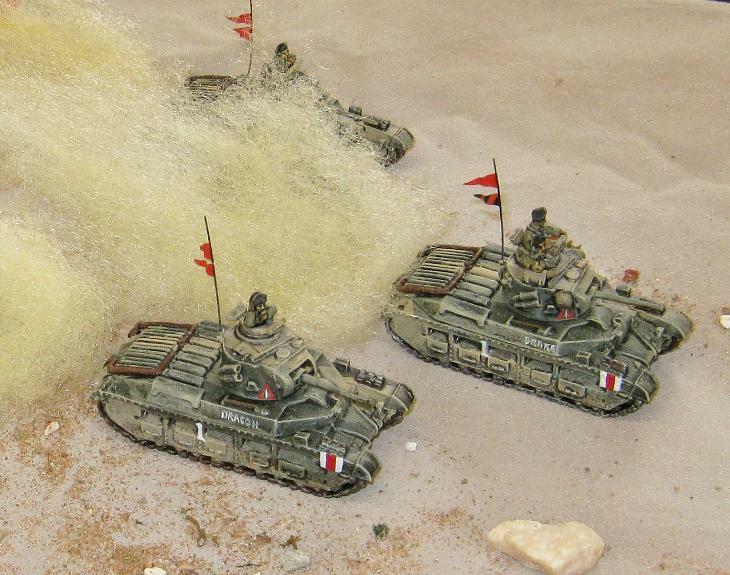 Italian tanks, we all thought! effect. My AT guns weren't activating as their cards were not coming up. pinning them preventing them from doing much. baseline. 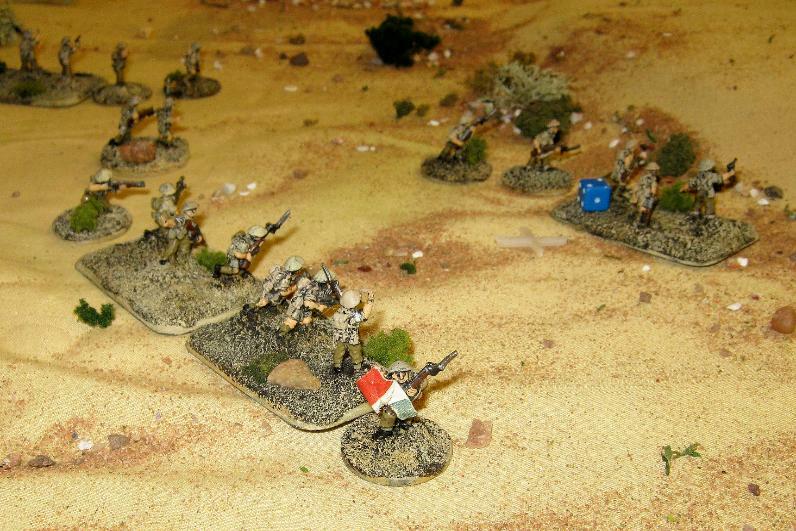 They had taken some casualties but considering they were still able to operate effectively. for a turn with possible engine damage. 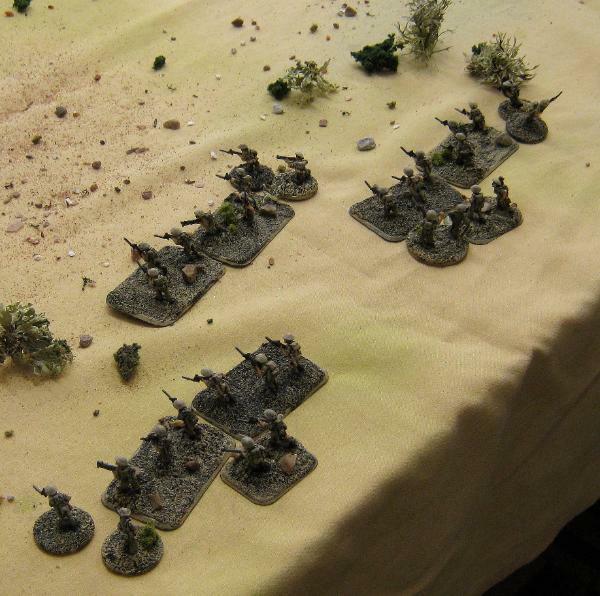 Our off table artillery and wounds/shock from the light mortars saw off the last AA gun and the Italian infantry section. there were still four more left to destroy to fulfill our victory conditions. much idea what was going on elsewhere but it was a very fun day out. Commonwealth players Clive, Dom, Edward, Gerrard, Zippee, Keith and Mick and not least to Martin Kay for his surprise appearance. Lard Island is like an annual pilgrimage to Lard.